Memorial: Dawlish Memorial Inscription HARRIS H. SERGT. DEVON REGT. 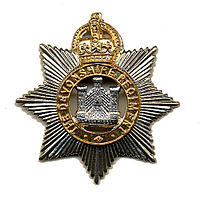 Without service records, as is common for most soldiers, it may be assumed that Henry John Harris joined the Devonshire Regiment prior to the war breaking out, possibly soon after his 18th birthday in 1910, for he is among those in the regular army battalion. They were stationed in Jersey at the outbreak of the war and returned to the mainland before landing in France as part of the British Expeditionery Force. His Medal Roll index card shows that he arrived in France on 6 November 1914, thus qualifying for the eventual award of the 1914 Star. The card also shows him serving with the 2nd Battalion, to which he may have been transferred at some point. He was a Private at the outbreak of War, earning promotion to Serjeant by the time of his death. The Devonshires fought a hard war (see their Military Story in ‘Documents’ here). In the summer of 1918 they were engaged in a number of battles in Northen France, not far from the monument at Thiepval. It is not known when Henry John Harris was wounded, only that he died from his wounds and is buried in the war cemetery at Bagneux. His grave carries the epitaph, “WHEN THY VOICE SHALL BID OUR CONFLICT CEASE CALL US O LORD TO THINE ETERNAL PEACE”. It was requested by his father. John Harris (1833- ) was an agricultural labourer, married to Margaret Cummins (1834- ) and living in Dawlish Water Cottages when they had a son, John (1864- ). He was one of six children, all born in Dawlish. John Harris junior married Loveday Stoneman (1859-1939) in 1885 . Loveday was born in North Tawton to George and Sophia Stoneman who had ten children. George also was an agricultural labourer and three of the children were employed as serge weavers and one as a wool spinner, natural occupations in a sheep farming community. But the census entry also records that one of their children had died by that time. Henry John Harris was baptised at St Gregory’s on 20 November 1892. Baptism - Find my Past.